BMW 5 Series is a sensational sedan series, which is doing quite well for the company. 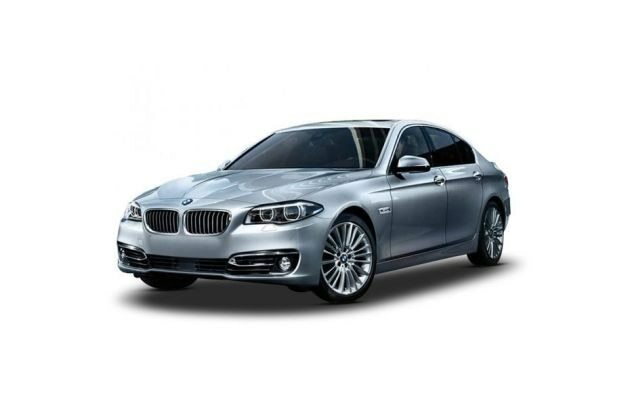 In India, it is being sold in three variants and BMW 5 Series 520d Prestige Plus is the entry level trim. It is equipped with a 2.0-litre diesel engine that comes with the displacement capacity of 1995cc. The power generated from this mill is about 190bhp along with a commanding torque output of 400Nm. It is mated with an 8-speed steptronic sport automatic transmission gear box that enables easier gear shifts. One of the most important features in this variant is the presence of BMW Secure Advance Package, which includes tyres, alloy wheels, engine shield, key lock out assistance, interior protection cover as well as 24x7 road side assistance for all its variants. It has a spacious internal section that is beautifully decorated and packed with several advanced features. Some of these includes ambient lighting, well cushioned seats, roller sun blinds for windows, air conditioning unit and the advanced BMW ConnectedDrive system that offers best in-car entertainment to its passengers. In terms of comfort, this vehicle is packed with some innovative features like electrically adjustable front seats, automatic anti-dazzle interior mirrors, gear shift paddles, cruise control function, rear view camera and many other such aspects. On the safety front, it is blessed with several features that ensure maximum protection to its occupants like head airbag system, crash sensors, tyre pressure indicator and a few others. The car maker is offering this sedan with twelve years warranty for the body work and three years for the paint work, which is a big plus point. It has an aerodynamic body structure with a number of styling aspects, which will lure many customers. The frontage has a signature BMW kidney bean shaped radiator grille that is treated with a lot of chrome. There is a large slanting bonnet, which has a couple of character lines and it is embossed with a prominent company insignia on the tip. This grille is flanked by a classy headlight cluster, which is incorporated with adaptive LED headlamps with auto high beam assistance. It also includes LED day time running lights that give the frontage a distinct look. Just below this grille is a body colored bumper that houses a wide air intake section for cooling the engine. The side profile is designed with body colored outside rear view mirrors with anti-dazzle and heating function. The neatly carved wheel arches that are equipped with an elegant set of 18-inch light alloy wheels that further gives a stylish look to its side profile. The car maker has designed its rear end attractively with some notable aspects. These include a radiant tail light cluster and there is an expressive boot lid that has the company's badge neatly engraved on it. Its body colored bumper is embossed with a couple of reflectors. This lavish sedan is blessed with a plush internal cabin that is packed with a lot of sophisticated features. It has a huge cabin space that provides comfortable seating for five passengers. It offers ample leg as well as shoulder space to its occupants, which makes them feel more comfortable. The company has used high quality materials inside the cabin that makes it look quite attractive. The seats are well cushioned and are covered with leather upholstery that gives the occupants a plush feel. It has electrically adjustable front seats along with lumbar support and memory function. The cockpit has a neatly designed dashboard, which looks quite elegant and is integrated with a stylish instrument cluster, sleek center console that is fitted with an infotainment system, chrome accentuated AC vents and so on. It also has a steering wheel that is wrapped with leather and mounted with a few control switches mounted on it. There is a multifunctional instrument display, which offers an impressive visual presentation. The ambient light with selectable mood lights and fine wood finishing on the dashboard further gives a classy look to its interiors. It has a sliding front armrest with storage compartment, while the inside mirrors come with automatic anti-dazzle function. As said above, this variant is equipped with a 2.0-litre, twin power turbo diesel engine, which comes with a displacement capacity of 1995cc. This in-line diesel mill is integrated with four cylinders and sixteen valves using double overhead camshaft based valve configuration. It is integrated with a common rail based direct injection and a turbocharger with variable turbine geometry, which helps in delivering a power packed performance. It has the ability to generate a maximum power of 190bhp at 4000rpm in combination with a peak torque output of 400Nm between 1750 to 2500rpm. This motor is cleverly mated with an 8-speed Steptronic automatic transmission gear box, which distributes the engine power to its front wheels. It is capable of returning a peak mileage of about 18.12 Kmpl on the highways, which comes down to around 15 Kmpl within the city. Whereas, it can break the speed barrier of 100 Kmph in around 7.1 seconds from a standstill and can attain a top speed of about 230 Kmph. The company has fitted all its wheels with disc brakes that ensures precise braking. It is equipped with anti lock braking system, which reduces the risk of skidding and improves the stability of this vehicle in sudden braking conditions. Furthermore, it also has cornering brake control system, electronic parking brake with auto hold function, advanced traction control programs including dynamic stability control. On the other hand, the front and rear axles are assembled with self leveling air suspension mechanism, which is further assisted by dynamic damper control with infinite and independent damping function. Its cabin is incorporated with a speed sensitive power steering with Servotronic steering assist function that is quite responsive. The cabin is blessed with various sophisticated features like an automatic air conditioning unit with rear AC vents and BMW ConnectDrive, which has a lot of advanced features. The list includes iDrive with 16.5cm display, Bluetooth with handsfree and USB interface, voice control, office functions. The front seats are electrically adjustable and these have lumbar support as well as memory function. Furthermore, it also has rear center armrest comes with two cup holders, inside rear view mirror with automatic anti-dazzling function, storage compartment package and push button engine start and stop function. The company has given it an automatic cruise control function, which helps in maintaining a steady speed on the highways as set by the driver. For a stress free driving experience, the manufacturer has given this variant a number of crucial aspects. It has an active protection, which includes attentiveness assist that further enhances the safety in case of any critical situation. This sedan is equipped with dual front airbags along with head and side airbags that provide effective protection in the event of any collision. The cabin is incorporated with an advanced electronic vehicle immobilizer along with crash sensors, which safeguards it from any unauthorized entry. Its rigid body structure has side and front impact protection beams, which enhances safety of the occupants sitting inside. It has runflat tyres with reinforced side walls along with runflat indicator that warns the driver with a light when there is a slight drop in tyre pressure. 1. Good engine performance with decent acceleration and pick up. 2. Asserting interior design with innovative comfort aspects. 1. Rear view camera can be added. 2. Spares and cost of maintenance is rather expensive.